5 Scuba Diving Bad Habits and How to Avoid Them! Its that time of year again! Time to dust of your scuba gear and get back into the water after 6 – 8 months of watching the weather, or is it? We are fortunate to dive all year round, this means that our skills are kept sharp and our kit is kept sharp fully serviced, but for many this is not the case. Each year as the scuba season explodes we always see some classic examples of scuba diving bad habits – from experienced divers no less! You ask your buddy, “You ready? Yeah? Let’s go diving.” Everything seems fine until you roll off the boat and discover you forgot your fins, your buddy’s tank is loose, or something even worse. Forgoing a buddy check takes a shortcut on safety and increases the chance of having to solve a problem in the water. You can learn more about avoiding and adapting to problems in the PADI Rescue Diver course, but the best thing to do (as we teach during the Rescue course) is prevent problems before they begin with BWRAF . There were some very expensive camera rigs on board, but an expensive setup doesn’t guarantee good photos. Especially when the photographer doesn’t know underwater photo basics, or fails to practice good marine life etiquette. I saw one diver with a top-of-the-line camera system taking a photo straight down over a coral head. I’m no photo pro, but I learned in the Digital Underwater Photography online course that shooting straight down on your subject tends to produce flat, uninteresting images. Perhaps it was an avant-garde shot. I watched another diver race from one critter to the next – chasing off marine life as he went. The dive guides tried to counsel this diver, but he wouldn’t listen, “This is how I always dive” was his reply. I wondered how many pictures of fish butts he had… and how he ever found a dive buddy! Every time I show up at at a tropical dive destination, other divers laugh at me for wearing a 5mil wetsuit and a beanie cap in 28C/82F water. But by wearing the exposure protection that’s right for me, I never have to cut a dive short because I’m cold. 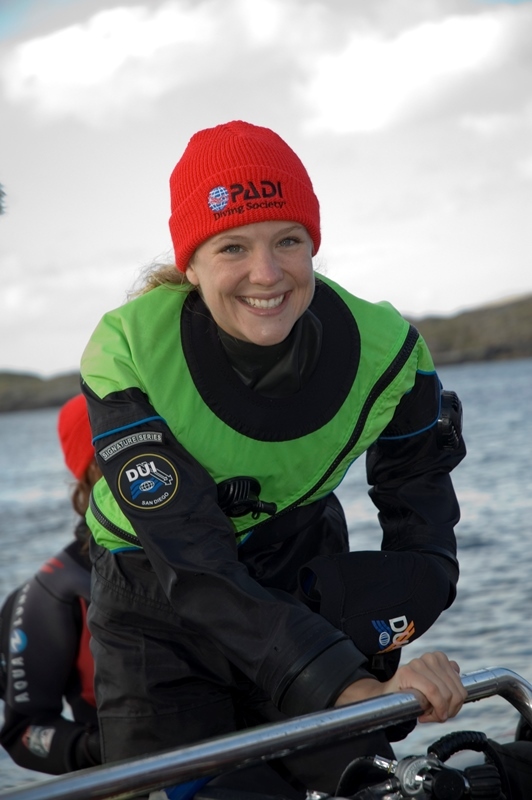 After a few years diving regularly in California I tried the PADI Drysuit Diver specialty and wondered, “why didn’t I do this sooner?” I imagine the cafe owners on Catalina Island wondered what ever happened to that girl who asked for cups of hot water to dump down her wetsuit. Picture a brick, the kind used in home building. Imagine carrying it around with you all the time – taking it up stairs, trudging up a hill, etc. Having extra weight on board means your body has to work harder; your breathing will be heavier and so on. When teaching the Peak Performance Buoyancy specialty course, that brick weight is (on average) the amount I take off a diver’s weight belt. New divers often wear excess weight, and get used to carrying it around. But there’s a major downside – too much weight can lead to excess air consumption. The extra weight means the body has to work harder to push through the water, and on top of it many divers swim continuously to keep themselves buoyant. All that extra effort drains your tank faster than necessary. Drop that brick and extend your dive time! 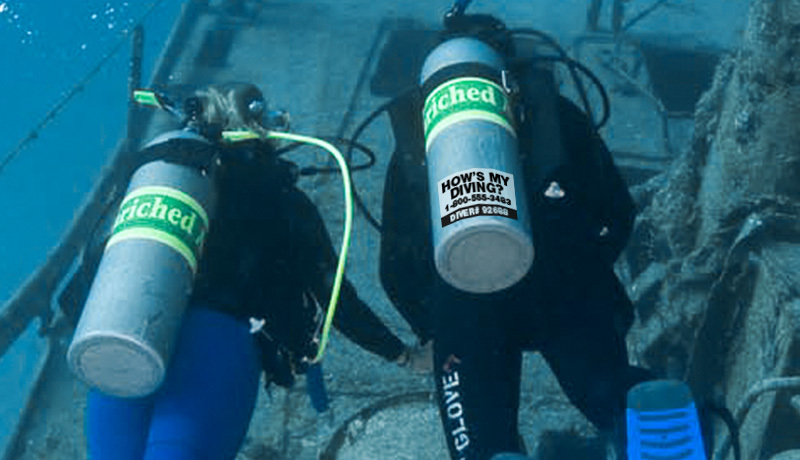 Review your open water materials for how to do a buoyancy check, or ask your instructor about the Peak Performance Buoyancy specialty course. Woe is the diver who pays half a month’s salary to go on the dive trip of a lifetime and has an equipment problem. When maintained properly, dive gear can last for years. 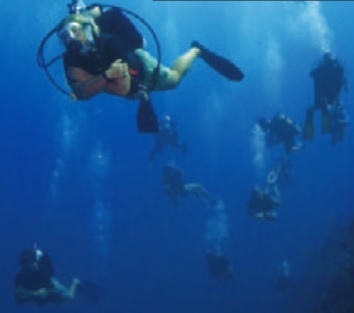 Ask your local dive center about the Equipment Specialist course. You’ll get to know your gear and learn how to perform basic maintenance yourself. That said: some equipment service must be performed by a professional. Use the gear locker section of your ScubaEarth profile to keep track of when your gear gets serviced. This entry was posted in Offers. Bookmark the permalink. I became a ceiitfred diver when I was 40 years old. I would check with your doctor first. I had ear surgery when I was a teenager that was caused by a ruptured ear drum that did not heal properly. Part of my recovery was to be able to hold my nose and clear my ears. What this means is that you equalize the pressure between your inner and outer ear or on both sides of your ear drum. This is a firm requirement for scuba diving. After talking to your doctor you can work on clearing your ears without being in the water. It feels the same as when you drive up or down from the mountains and your ears get plugged up and then finally pop on their own. But you should be able to do this on demand. If you can learn to do this then you can do a test (under qualified supervison) in your pool. Swim down to the deep end of a deep pool and you will feel pressure on your ears. When you clear them the pressure feeling will go away. When diving down to 20 and even 60 feet or more you usually only have to do this twice on the way down and then you are good until your next dive. Also diving can be easy off a boat where there is no current or harder off a beach or off a boat where there is current.Yes there are currents out in the ocean just like in a river.I suggest going off a beach in Mexico or Hawaii with a dive master to help you if you get that far. Good Luck.References : Experience Was this answer helpful?